Cook pasta according to package instructions. Drain and set aside. If using fresh shrimp, peel and devein. In a medium pot, add ½ lemon, and optional bay leaves and peppercorns. Add enough water to cover shrimp. Bring water to a boil. Drop shrimp in and cook for 2-3 minutes or until just pink. When done, drain shrimp and place in a bowl with ice and water to shock the shrimp. (Shocking stops the cooking process.) When shrimp are chilled, drain and set aside. Make dressing. In a medium bowl, combine mayonnaise, chili sauce, lemon juice, Worcestershire Sauce, sweet pickle relish and salt and pepper to taste. In a bowl, combine pasta and shrimp and toss with enough dressing to coat. Serve remainder of dressing on the side. Assemble salad. Arrange a few whole romaine leaves on one side of plates. Chop up the rest of the romaine and place in center of bowl, dividing among the four bowls. 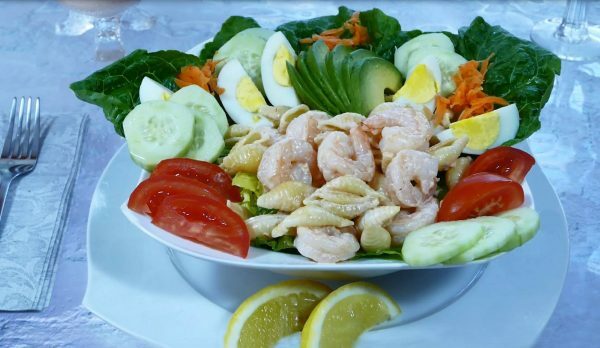 Put equal amounts of shrimp and pasta on top of each bowl of romaine. Arrange quartered eggs, tomatoes, sliced cucumbers and avocados on the plates. Place several clusters of shredded carrots on the plates. If desired, drizzle a small amount of dressing over the top of the salad. Or, just serve on the side. Place 1 slice of lemon on the plate or on the serving plate for garnish.